Don’t worry. Only the bandana is satin. Yeah we’re late but at least the site is working! …I hope. If not, I may have to eviscerate myself. Another page will be up Saturday! Or sometime close to that. Why do we even bother with a ‘schedule’? Glad that you like Summer’s humor! 🙂 He’s definitely fun to write! lol i don’t blame him though that outfit is just a bit too sparkly! But i so enjoy to see him finally running around in it!! I hope that outfit is magically self-cleaning, too. Can you imagine Mike taking a satin bandana to the dry cleaner’s? I want that belt buckle ._. I know I want it! If only I was good at making metal things… alas! I think… I think I have a friend who works in welding and metal work. I think I’m comissioning that belt buckle…. Oh man… I can only imagine how confused and horrified other con-goers would be if you made this atrocity against fabric. XD Also, I’d say I’m concerned that you have all these colors but the truth is our sewing room is overflowing with awfulness. I hope her and the mugger won’t be too busy laughing at him. Love this page! Love the way you turned his toes in. Really gave me a LOL op.Very cute. You guys are so stinkin’ clever! 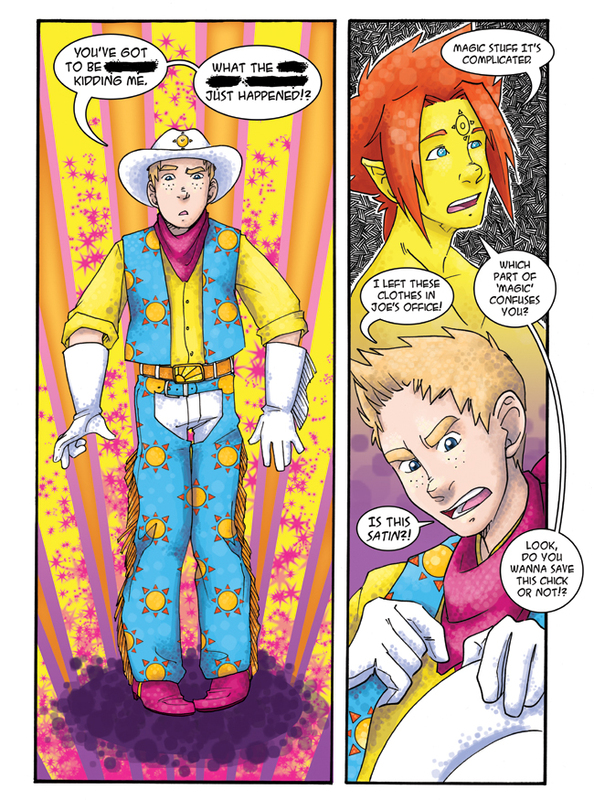 A “magical BOY” comic opposed to the stereotypical “magical girl” like Sailor Moon, it’s just too funny for words. the fact that one of his peers actually designed that makes it about a thousand times better.